ww2dbaseKarl Hermann Frank was born in Karlsbad, Austria-Hungary (now Karlovy Vary, Czech Republic) in 1898. While a student at the Charles University in Prague, Czechoslovakia, he attempted to join the Austro-Hungarian Army during WW1, but was rejected due to an eye injury. During the inter-war years, he was a book store owner and joined various right wing organizations. He joined the Sudeten Nazi Party in 1919. He married his first wife Anna Müller in 1925; they would have two sons together, Harald in 1926 and Gerhard in 1931. He contributed in the formation of the Front of Sudeten German Homeland in 1933. In 1935, the Front of Sudeten German Homeland was renamed Sudeten German Party, and Frank was made its deputy leader; in the same year, he was elected a member of the Czechoslovak Parliament. In Oct 1938, Germany annexed the Sudetenland region of Czechoslovakia, and Frank was made the region's Deputy Gauleiter. In Nov 1938, he was given the rank of SS-Brigadeführer by Heinrich Himmler. In 1939, he was promoted to the rank of SS-Gruppenführer and given the concurrent positions of Secretary of State of the Reich Protectorate of Bohemia and Moravia and the Higher SS and Police Leader of the protectorate. As the head of police in German-occupied Czech lands, he was responsible for arrests and executions of political opponents of the Nazi regime and for the deportation of Jews. In 1940, he divorced Anna Müller; later in the same year, he married physician Karola Blaschek, with whom he would have three children, daughter Edda in 1941, son Wolf-Dietrich in 1942, and daughter Holle-Sigrid in 1944. Frank was among the top leaders responsible for the massacres in Lidice and Lezáky, which were committed as retribution for Reinhard Heydrich's assassination in May 1942. 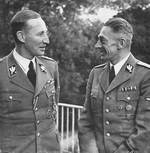 In Aug 1942, he was made the Reich Minister for Bohemia and Moravia. 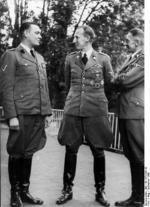 In Jun 1943, he was promoted to the rank of SS-Obergruppenführer and was made the General of Police in Prague. During the Prague Uprising of Apr-May 1945, he ordered the police to fire at anyone who disobeyed orders. Frank surrendered to the US Army in Plzen (English and German: Pilsen) on 9 May 1945. He was tried in Prague between Mar and Apr 1946 and was found guilty of war crimes. He was executed by hanging using the pole method (German: Würgegalgen) in public before a crowd of 5,000 at the Pankrác Prison in Prague on 22 May 1946. He was buried in an anonymous pit at Dáblice cemetery in Prague. 24 Jan 1898 Karl Hermann Frank was born in Karlsbad, Austria-Hungary (now Karlovy Vary, Czech Republic). 21 Jan 1925 Karl Hermann Frank married Anna Müller. 20 Jan 1926 Karl Hermann Frank's son Harald was born. 22 Apr 1931 Karl Hermann Frank's son Gerhard was born. 17 Feb 1940 Karl Hermann Frank and Anna Müller were divorced. 16 Aug 1941 Karl Hermann Frank's daughter Edda was born. 9 Jun 1942 SS personnel under Horst Böhme, Karl Hermann Frank, and Kurt Dalüge surrounded the village of Lidice, Czechoslovakia. 20 Aug 1942 Karl Hermann Frank's son Wolf-Dietrich was born. 8 Mar 1944 Karl Hermann Frank's daughter Holle-Sigrid was born. 30 Apr 1945 German police chief Obergruppenführer Karl Hermann Frank announced over radio that any attempt to rise up by the citizens of Prague in the puppet state of Protectorate of Bohemia and Moravia would be wiped out violently. 9 May 1945 Karl Hermann Frank surrendered to the US Army in Plzen (Pilsen) in occupied Czechoslovakia. 22 May 1946 Karl Hermann Frank was executed by hanging at the Pankrác Prison in Prague, Czechoslovakia.